In Egypt, both the military and the Muslim Brotherhood accuse each other of being American stooges while discreetly courting Washington. Not to be left out, the counter-revolution has also been redefining a number of ancient proverbs. No longer is the enemy of my enemy considered my friend. Rather, my enemy’s friend is, discreetly and surreptitiously, my ally. This paradoxical paradigm is nowhere more apparent than in the conflicting relationship of the two main competing factions – the military and the Muslim Brotherhood – with the United States. According to prevalent Muslim Brotherhood mythology, the downfall of President Mohamed Morsi was engineered by an unholy alliance consisting of the Egyptian military, led by Morsi-appointed General Abdel-Fattah al-Sisi, Washington, and Israel cast in worst supporting role. When I visited the pro-Morsi, Raba’a al-Adawiya protest camp, which was murderously dispersed in mid-August, several of the protesters I spoke to were convinced that a US-Zionist conspiracy was afoot. 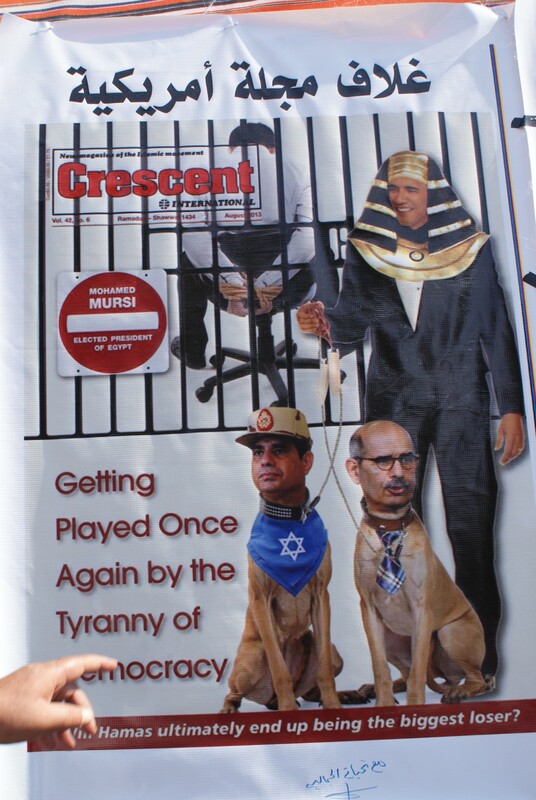 This was encapsulated in a poster which one of the protesters insisted on taking me to view, which featured Barack Obama, dressed as pharaoh, holding an al-Sisi dog on a short leash, with a Star of David bandanna round his neck. Nevertheless, in a bizarre form of ideological dissonance, these same protesters were hostile towards local media and saw the Anglo-American press as their champions, with many calling on Washington and the West to take decisive action against the coup, and to reinstate Morsi. And this contradictory position is not just one subscribed to by the Brotherhood’s rank and file. “America tried to abort the Egyptian revolution by spending $105 million on Egyptian and foreign organisations in a few months with the aim of causing chaos,” claimed Mahmoud Ghozlan, a member of the Brotherhood’s Guidance Council and the movement’s official spokesperson in Arabic. 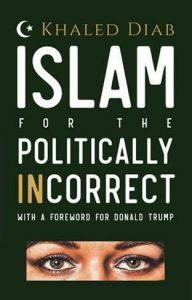 Yet while in power, Morsi and the Muslim Brotherhood cosied up to Washington, as well as American and Western public opinion. “Contrary to the Brotherhood’s anti-American slogans, Morsi’s priority was to maintain good relations with Washington,” an Egyptian diplomat said. And devoid as the Muslim Brotherhood proved of actual policies, despite decades of sloganeering and posturing, Morsi’s foreign policy “simply copied the Mubarak regime”, as one Egyptian analyst put it. This keenness to please Washington was reflected in the Morsi government’s mediation of the military confrontation between Israel and Gaza in November 2012. This earned the former president plaudits from the United States, which he seemed to have interpreted as a green light to grant himself “absolute power”. This has, of course, been fodder for the Muslim Brotherhood’s enemies. In a similar fashion to their Islamist opponents, pro-military Egyptians allege that it is Morsi, not al-Sisi, who is an American agent. Some also subscribe to some pretty outlandish conspiracy theories that come straight out of the “Birther” handbook. For example, it is rumoured in some Egyptian circles that Barack Obama is a secret Brotherhood member and that the 2012 presidential elections were rigged, at the behest of Washington, in favour of Morsi. And, according to this viewpoint, the conspiracy is far from over, as reflected by the controversy over statements made by former US ambassador to Cairo, Anne Patterson. One lawyer has even gone so far as to file a complaint against Morsi’s wife, alleging that she is conspiring with the American administration to topple al-Sisi and sow sedition and terrorism in Egypt. It is ironic that supporters of the institution which benefits from the greatest US support – to the tune of hundreds of millions of dollars of military aid annually – should cry conspiracy in this way. Awareness of this contradiction could be partly behind the calls issued by Tamarod – the youth-led movement, whose name translates as Rebellion, which spearheaded the anti-Morsi protests – to reject American military aid. At a deeper level, what is behind this paradox of “my enemy’s friend is my ally”? One undeniable factor is America’s own behaviour. Although the US talks the talk when it comes to democracy, freedom and self-determination, Washington often walks roughshod over these principles when it considers its “vital interests” are at stake. In Egypt’s case, that manifested itself in Washington’s longstanding support for malleable dictators, including Hosni Mubarak, and Anwar al-Sadat before him. Since the 2011 uprising, the Obama administration has tended to prefer “stability” over principle, weighing in behind the country’s strong man of the moment, whether it is Mubarak, Morsi, Field Marshal Tantawi or General al-Sisi. Domestically, the instability and uncertainty that has reigned over the past three years has laid fertile ground for the emergence of conspiracy theories. Moreover, for their own historical reasons, both the secular and Islamist movements have striven to rid Egypt of foreign influence, whether it was Ottoman, British, Soviet or American. This took off in earnest with another revolution almost a century ago, led by Egyptian centrist and rightist liberals, mainly al-Wafd. Not long after, Hassan al-Banna set up the Muslim Brotherhood, also to counteract British influence, but shunning al-Wafd’s secular liberalism in favour of conservative Islam. For leftists, the benchmark for secular, pan-Arabist independence was, at least ostensibly, set by Gamal Abdel-Nasser, who spearheaded the 1952 revolution/military coup. However, for all three streams, aspirations for complete sovereignty became tempered by realpolitik, and the realisation that any regime has a relatively low chance of survival without Washington’s blessing. Despite this, it remains politically expedient to cast aspersions that America is your enemy’s friend while, simultaneously, discreetly courting Washington as an ally. This article first appeared in The Guardian on 13 January 2014.